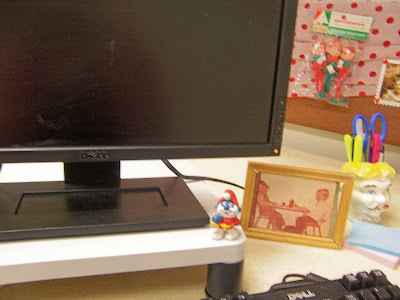 In my former job, I had the pleasure (and the curse) of working from home. In many ways, it was fabulous because I am a big ole' homebody and am quite happy with a quilt, a cup of coffee and a lap top to pound away on while big snowflakes sashay past my office window. Bad because, when you work from home......you are always at work. 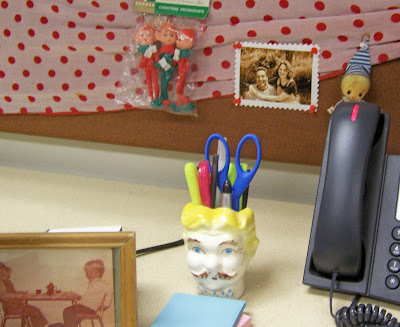 Photos of family in Black and White, quirky circa 1950 ornaments, Valentines (thank you Alba! 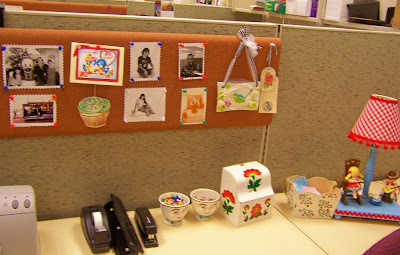 ), and Jenny Holiday cupcake, and a lovely handmade blue bird plaque created by my immensely talented neighbor, decorate the pin boards. 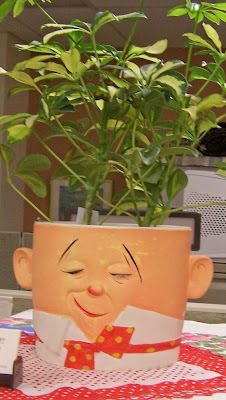 A vintage head planter (otherwise known as "the boyfriend") holds pens, pencils, highlighters and the like. My other "boyfriend"..... a cookie jar (husband broke the lid in a frantic cookie excavation) holds the requisite office plant. We joke that these two boyfriends get into fights at night.... hey Pixar... how about a movie with office staples that talk and do the real work at night, ala shoemakers' elves??? 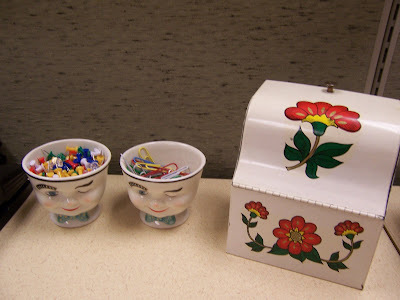 Bailey's happy winky face cups and a vintage tin recipe file are creative containers for office essentials like push pins, paper clips and business cards. 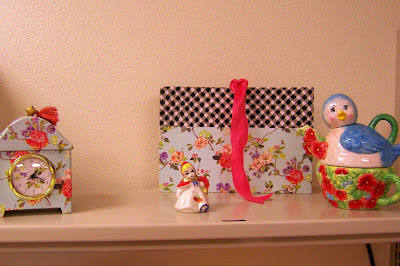 Where books and binders should go is a sweet vignette. 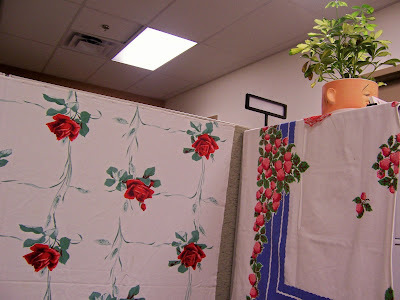 I choose some of my favorite vintage linens to hide the dreary gray of walls and file cabinet. This is what I have done so far, but am on the prowl for some more art to hang. I love the charm of paintings like these by Mystele. Not quite home sweet home but it's a start. Thank for taking the tour! Another great project from MyLifetime.com. This time, a shadowbox with the O'Neil sisters. This project would make a fantastic gift for a birthday or mother's day. Although it's late for Valentine's Day, think about how you could change it using a different shape or materials! Enjoy! Today is our 16th anniversary. My husband and I will drive down to Prescott after work, stay in a lovely old B & B, and have dinner in the same restaurant that we ate in on the eve of our wedding. Tomorrow we will spend the day scouring thrift and antique shops for the perfect present to gift to each other. 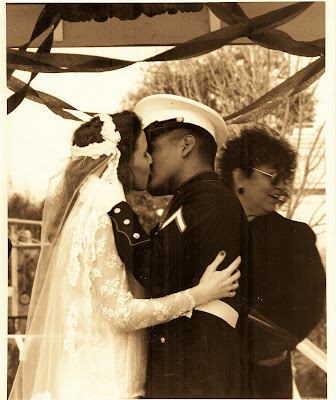 Married at such a young age, it hasn't always been easy for us (is it for anyone?) He puts up with clay ground into sofa cushions, and a super girly cottage bed room, complete with rose festooned Shabby Chic bed linens. I put up with a policeman's schedule (and stress), and him banging on his drumset for what seems like hours (to relieve aforementioned stress.) Not to mention his ever expanding catalog of The Who songs that must be played on every. single. long. roadtrip (he makes fun of me listening to Jeff Buckley nonstop). We agree to disagree on many things, we have fights about all the usual stuff. But beyond all of this we are each other's soft place to land. Did you know that the amazing geniuses at Stampington have their own Youtube channel? So many pretty ideas! Of course I had to pick this one in honor of Valentine's Day. Happy early one and I hope you enjoy the awesome video. By the way, if you haven't subscribed to the Stampington newsletter Creative Impulse, I encourage you to do so here... . It's free, and (I think) it arrives in your inbox every Friday. Another reason to look forward to weekends! 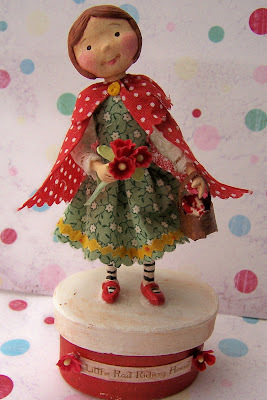 One of everybody's favorite fairy tale heroines, here's my version in paper clay! I have been wanting to make a "Little Red" for so long. I was so excited when I finished her late this afternoon I didn't even let the glue dry on the forget me nots before I started snapping photos. "Little Red" has hands, legs and head sculpted from paper clay. She is in miniature doll house scale, measuring only 5 inches tall (6.5 if you add the box). Her body is a wire armature that was wrapped with wool felt. A variety of vintage and new fabrics were used to create her dress and her famous cape (I am really loving my new scalloped pinking sheers!). The yellow button fastening the cape to her neck was also made from paper clay. I couldn't find a mini basket for her so I made one out of brown scrapbook paper. And of course she has to carry some sweet millinery forget me nots for grandma! 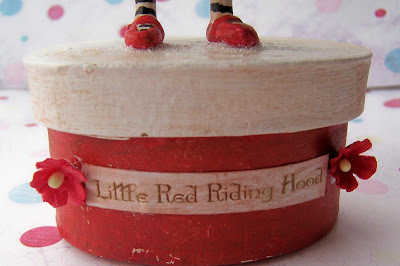 "Little Red" Stands upon a painted paper mache box that was lightly sugared with German Glass Glitter. 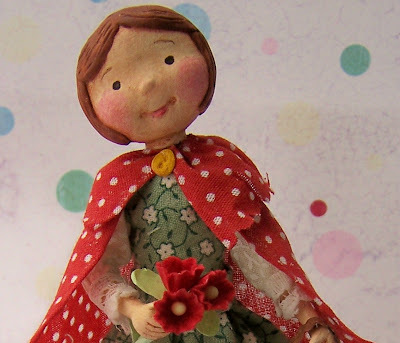 She is second in a series of storybook dolls that I am creating for PFATT each month. She'll be available for sale (usually by midnight) on the 10th. I hope you like her as much as I loved making her!!! I can't wait to start working on next month's storybook inspired sweetie. 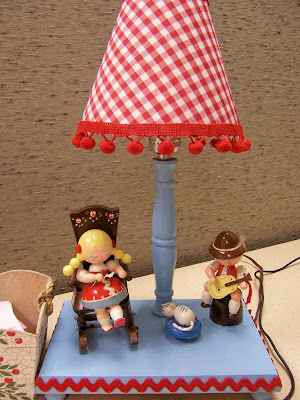 In honor of Spring, I think I'll create a Little Bo Peep. What are some of your favorite fairy tales and Nursery Rhymes? I am so glad you like the idea of my sharing the best video tutorials I can find on the web. There is lots of user created content to choose from, but this week, I thought it might be fun to go with a classic. Remember the good old HGTV... the one with craft shows and home tips. 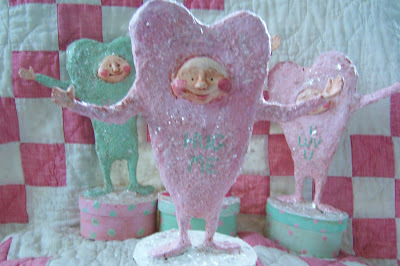 Shows like Carol Duvall , Crafters Coast to Coast and Typical Mary Ellen. Call me sentimental, but I miss the old format and the programming!